The DunwoodyTalk blog has as good an explanation as I’ve read for how Holmes E. Pyles came in first in the DeKalb County Commission District 1 race. A simple word was placed under each candidate’s name on the ballot. Four of the five had ‘Republican’ listed and one had ‘Independent’ listed. Only Holmes E. Pyles was not listed as a Republican. The runoff of Jester and Pyles will take place next month and will be the only item on the ballot. The Dems won’t be back as the Republican vote is much bigger. Jester will not have three opponents competing for the Republican votes. We all know now that it is possible for a Democrat to make the runoff in District 1, but the chances of a Democrat winning the spot is low. Jester will need a strong turnout for the runoff. 1. Georgia Republicans Need A Competitiveness Assessment. Last night was a huge win for Republicans nationally and in the state of Georgia. The GAGOP Victory Program, led by Chairman John Padgett and staffed by countless volunteers and sharp field directors, executed an unprecedented ground game in the Peach State. Over 350,000 doors knocked. Over 1.2 million volunteer phone calls – including 87,000 on Monday alone. Millions of pieces of mail dropped. It provided the rock solid foundation of success for our entire statewide ticket. But Georgia Republicans should not be lured into complacency by this one night of success. We must also see clearly the political environment and the national wave the swept the country last night. President Obama’s failed leadership is as popular as Ebola right now. But he won’t be on the ballot again. 2. It’s Time For Georgia Republicans To Get Real. Georgia is diversifying. In comparative demographic terms, Georgia is now the state of Virginia (metro Atlanta) dropped down in the middle of Alabama (the rest of our state). Our rural areas may continue to be part of the “old south” but the metro Atlanta region is a vibrant and diverse international community. Bluntly speaking, Georgia Republicans can no longer rely on simply appealing to white voters. We must diversify our approaches and speak to this new Georgia with a bold message about economic opportunity and effective governing. 3. Public Polling In Georgia This Cycle Was A National Embarrassment. In the recent article “Are Bad Pollsters Copying Good Pollsters” on the highly respected Five Thirty Eight Blog, Harry Enten details how “polling” by non professional polling groups in states where a “Gold Standard” polling program does not exist are wildly inaccurate and tend to copy the results of legitimate pollsters as election day nears. In 2014, Georgia is the new case study for this assessment. As a highly respected political consultant friend told me recently, if these supposed pollsters for media outlets had been employed by campaigns and had been so wrong so frequently, they would have been laughed out of the business. It’s worth reading in its entirety if you’re interested in the business and process of winning elections, even if I don’t agree with everything he writes. Speaking of polling, the Atlanta Journal-Constitution is living in a glass house when it criticizes the public polling in Georgia, but they continue anyway. Some of those predicting runoffs didn’t take into account caveats, like margins of error and undecided voters, that swung the numbers. Meanwhile, some earlier surveys were simply imprecise. They relied on automated calling and Internet surveys, cheaper methods scorned by more established pollsters. “We have major polling problems (in Georgia),” said Kerwin Swint, chairman of the political science department at Kennesaw State University. Survey after survey suggested that Republicans Gov. Nathan Deal and U.S. Senator-elect David Perdue might not surpass the 50 percent benchmarks needed to avoid long, costly and unpredictable runoffs. Landmark Communications, based in Alpharetta, surveyed Georgia voters in the final days before the election and placed both Deal and Perdue with leads. “We identified the Republican surge that took place in the closing days,” Landmark president Mark Rountree said. The Atlanta Journal-Constitution commissioned New York-based Abt SRBI Inc. That survey, which used a mix of live calls to land lines and cellphones, took place Oct. 16-23. It showed the governor’s race in a dead heat and Perdue holding a slim lead in the Senate race. In it, the Libertarian candidates had 6 and 5 percent of the vote respectively. Ultimately that support was pegged at just 2 percent Tuesday night. Experts say the technique used by pollsters is significant. Live calling to homes and cell phones is considered the gold standard. Most of the public polls are done through automated calls to homes that under federal law cannot be made to cell phones. About 30 percent or more of registered voters only have cell phones so they are excluded. The AJC did not poll the Republican or Democratic primary races because low turnout and primaries not confined to party registrants would have made the polling results, in its view, too unreliable. Gold standard my tailfeathers. Not only were they unable or unwilling to poll the primary elections, they also didn’t poll the last twelve days – nearly two weeks – of the election. There are strengths to live agent phoning to random-digit phone numbers, but getting in-and-out of the field quickly is not one of them. The question of whether to use IVR “robopolls” or the much-more expensive live-agent polling is best answered, “yes.” That is, use both. Live agent polling is often better in the early stages of the election for message testing when you’re using a long survey instrument, and as occasional benchmarks to fine-tune your sampling frame and the model that predicts the composition of the electorate. IVR is stronger when you need results fast and often. I often run IVR surveys every night the last two-to-three weeks of an election, with sample sizes of 1000-1500 every night. This allows you to be in the field every night affordably. The continuous nature of this style of tracking allows you to pick up trends earlier and more accurately track how voters are converting from undecided to decided. IVR is also very strong with a homogenous electorate, such as within a Republican Congressional District or a Metro Atlanta county Primary, less so in a more diverse electorate. The difference between the two forms of polling is like the difference between a Ford that you can buy at the dealership and the cars that carry the blue oval in NASCAR races and on drag strips. They both carry the same name, but the difference in specific use, cost, and convenience will often determine which you use. If you’ve got millions of dollars and want to win a race more than anything else on earth, you buy a racecar. If you want to go to the grocery store and pickup the kids from school, you buy a Taurus. If you’re running a second-tier statewide race and don’t have millions of dollars, you might be able to run a live-agent poll one time – at the beginning or the end – but it won’t be of any use and you’d be better using Robopolling or spending the money on advertising. Media polls are not designed to provide the level of information that campaigns rely on and no sane campaign strategist will pay attention to make his or her decisions on the basis of what public pollsters say. Media polls are designed to provide inexpensive fodder for “horse race” stories, and while the respective media outlets take their accuracy seriously, it’s simply not the same as strapping on a race car. Non-professionals following public polls closely also may have unrealistic expectations when it comes to polls – polls taken weeks out do not by themselves predict the results of elections. When I predicted last Friday that Nathan Deal and David Perdue would win without runoffs, it wasn’t simply because I checked the most recent polls. I looked at the RealClearPolitics average and saw that Deal was in the exact same position – 48.0% – that he was in 2010 when he walked away with a victory over Roy Barnes. I considered the strength of the GAGOP voter contact program that at the time had made more than 1.5 million direct voter contacts. I considered what appeared to be a trend nationally of Democratic candidates cratering and undecideds breaking for the Republican party. Finally, I applied “Kentucky windage,” or my estimate of which way the wind was blowing based on my own personal experiences. Professional strategists running multimillion dollar campaigns will have all these tools, plus their own internal polling, probably that of their respective state party and national organizations, and other analytics, like the results of Voter Indentification calls. An AJC article is out tonight saying that polls were off in Georgia. Actually, no, and this premise is not correct. • Landmark correctly nailed in Georgia the GOP surge that surprised many other pollsters across the country. • Landmark nailed the Democratic candidates’ numbers essentially on the head (actual was 45% for both, we had them with 45% and 46% respectively). • Landmark quite accurately nailed the Libertarian numbers (2% & 3%). • Landmark also reported the GOP candidate numbers very close to the mark — it’s pretty hard to get much closer than what we released in our final poll. • Landmark also had undecideds lower than anyone and ran with the call. Remember also, I wrote earlier this week and again today, that the RealClearPolitics average showed Gov. Deal at 48.0 just before election day, the exact same as he was at that time in 2010. Deal won 52.8% Tuesday night and in 2010 he took 52.9% against Democrat Roy Barnes. Consistency of results and repeatability are also important criteria for judging polling, and the aggregate of public polling was both consistent and repeated its performance. Remember also that a single poll shows a snapshot of a moment in time for an electorate in flux and under the influence of millions of dollars of advertising. You can’t make a good prediction from one poll – looking at polling holistically, not only did the public polls show consistently both Deal and Perdue ahead, they also showed both Republican candidates on upward trajectories as undecided converted in favor of the GOP. If you got the wrong answer from this year’s polling, you weren’t looking at the whole situation. 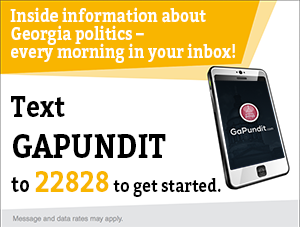 Georgia was the subject of National Election Pool exit polling this year for the first time since 2008. We’ll be diving into both the exit polls and the Secretary of State’s data on voter turnout over the coming days, weeks, and months, but here are a few snapshots from the early analysis, here from the New York Times. These graphics show that the Republican candidate for U.S. Senate, David Perdue, appears to have doubled the GOP’s share among African-American voters and increased it among both men and women. Interesting. I suspect Governor Deal carried more of the votes of African-Americans. We’ll see. Joel McElhannon of Parlay Political served as the primary political consultant to the Georgia Republican Party’s Victory 2014 Program. Joel wrote this on his own after seeing the results of this year’s elections. Whether you love him or hate him, Joel McElhannon possesses one of the best political minds in the state and you should pay attention when he writes on the topic. Yes, Jason Carter and Michelle Nunn bellyflopped yesterday. But that does not mean Georgia’s population is not changing. It does not mean the Democrats will discontinue their ground game efforts. It does not mean radical liberal groups will not continue their vicious and possibly illegal tactics on election days to cause chaos and confusion for voters and lay the foundation for more frivolous lawsuits. Despite a warm day in the sun, there are dark clouds on the horizon, and Republicans in Georgia should prepare now. For the future, there are two key numbers to remember – 11% and $2.6 million.Continue Reading..
Bacon, Barrow, Candler, and Evans Counties were created on November 3, 1914 when voters approved Constitutional Amendments – prior to these Amendments, Georgia was limited to 145 counties. On the same day, Carl Vinson was elected to Congress from Georgia, becoming the youngest member of Congress at the time. Vinson would eventually become the first Member of Congress to serve more than fifty years. Vinson’s grandson, Sam Nunn would serve in the United States Senate. The Chicago Tribune published the infamous “Dewey Defeats Truman” headline on November 3, 1948. Ultimately, Democrat Truman won 303 electoral votes to 189 for Republican Dewey. Laika, a female Siberian Husky mix who was found stray on the streets of Moscow, was launched into space aboard Sputnik 2 on November 3, 1957. On November 3, 1968, Democrat Lyndon B. Johnson was elected President over Republican Barry Goldwater. On November 3, 1970, Jimmy Carter was elected Governor of Georgia. Democrat Cynthia McKinney became the first African-Amercian female elected to Congress from Georgia on November 3, 1992. On November 3, 1998, Democrat Thurbert Baker was elected Attorney General and Michael Thurmond was elected Commissioner of Labor, becoming the first African-Americans elected to statewide executive office in Georgia. Bill Lee, who served forty-two years in the State House of Representatives, serving Clayton County, has died. The representative from Forest Park had built up enough respect and prestige during his 42 years in the house that Speaker of the House Tom Murphy made him chairman of the powerful House Rules Committee. In that position, he decided which legislation came to the House floor for a vote by the full body. “Because he was the chairman of the Rules Committee, he was the second most powerful person in the House,” said former state Rep. Ron Dodson, who was Lee’s hand-picked successor in the legislative body. Lee, who served in the House from 1956 until 1998, died Wednesday, according to his obituary which ran in Friday’s Clayton News Daily. He was 88. Republican Senate candidates are pulling away in the final days of key races, according to polls released this weekend. Republicans are either leading in Georgia, Kentucky and Louisiana or will likely win runoff elections, according to a NBC/Marist poll released Sunday. In addition, the Republican nominee in Iowa, Joni Ernst, now has a 7-point lead over Democratic challenger Rep. Bruce Braley, according to a Des Moines Register poll released Saturday. Most polls have shown until now that the four races have essentially been deadlocked in the closing weeks. The GOP needs to win a net total of six Senate seats to take control of the chamber, with essentially only the West Virginia and Montana contests apparently in hand. Republicans entered the final weekend before the midterm elections clearly holding the better hand to control the Senate and poised to add to their House majority. But a decidedly sour electorate and a sizable number of undecided voters added a measure of suspense. The final drama surrounded the Senate, which has been a Democratic bulwark for President Obama since his party lost its House majority in 2010. Republicans need to gain six seats to seize the Senate, and officials in both parties believe there is a path for them to win at least that many. President Zachary Taylor died of cholera on July 9, 1850 and was succeeded in office by Millard Fillmore. On July 9, 1864, Confederate troops retreated across the Chattahoochee River from Cobb County into Fulton County. Upriver, Sherman’s troops had already crossed and moved toward Atlanta. From the Marietta Daily Journal previewing last night’s debate for Cobb County Commission between Bob Weatherford and Bill Byrne. “Our personalities are different. I have one and he doesn’t,” Weatherford declared. moderator Pete Combs pointed to the microphones. “They’re microphones, they’re not clubs,” Combs said, prompting laughter. I moderated the debate in Oconee County between Mike Collins and Jody Hice for the Republican nomination for Congress in the Tenth District. Hice is a fine candidate on the stump and outperformed Mike Collins, but one thing he said gave me pause. The question was whether Christianity is under attack in America, the role of Christianity in government, and whether the federal government should play a role in the issue. That’s a small snippet of a longer answer to the question, but that excerpt concerns me as a Chrisitan and a Conservative. The concern I have is that as a Conservative, I believe that government is an inefficient tool for solving social and cultural problems. Looking at the war on drugs that began in the 1980s, after nearly thirty years, government intervention yielded stronger and more effective horrifying drugs like the rising popularity of methamphetamine, a jail system so overcrowded that many states, including Georgia, are rethinking and reducing drug sentences, and a culture that is more tolerant than ever of the recreational use of drugs and alcohol. Kelsey Cochran of the Athen Banner-Herald covered the debate and writes about an exciting moment. The most contested portion of a debate between the remaining Republican candidates vying for the 10th Congressional District came after Jody Hice took a jab at his opponent Mike Collins’ father, former U.S. Rep. Mac Collins. “You’ve said a number of times that your political philosophy is closely identified with that of your dad. He was very good on some social issues, but he went along with the establishment. …This looks like a sequel that’s a nightmare,” Hice said after citing several votes by the elder Collins to raise the debt ceiling, his own salary and to approve the No Child Left Behind Act. Collins defended his father’s conservative voting record before pointing his finger at Hice for statements in his 2012 book perceived by some as anti-Islamic. “In order to be a good congressman, you’ve got to be effective. My opponent wants to limit First Amendment rights for certain American citizens,” Collins said. Hice rebutted by saying Collins was “truth-challenged” and said his published statements were taken out of context and lain with liberal talking points in recent news reports. In the end, both men said they are in favor of protecting the First Amendment rights of U.S. citizens. I hadn’t realized that Mac Collins was in the audience, but if I were in charge of the next debate, I’d give serious consideration to allowing that opportunity. There was a lot more to the debate, and I got home late last night, so I will discuss more of what happened in the next couple of days. 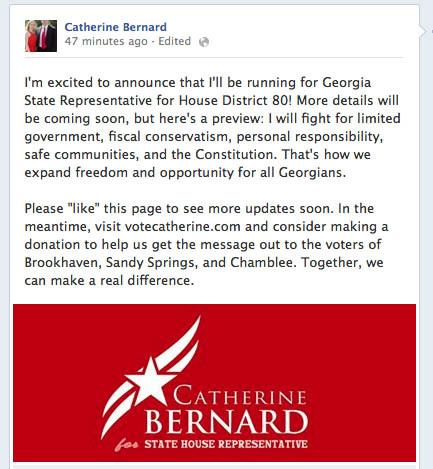 I want to thank the Tenth District Georgia Republican Party, Tenth District GAGOP Chairman Brian Burdette, and Dennis Coxwell, chairman of the 10th Congressional District Republican Debate Planning Committee for allowing me to participate. The hundred chairs set out by Dennis Coxwell and Oconee County GOP Chair Jay Hanley were filled with voters, many of whom were not the “usual suspects” who show up for GOP meetings, but instead ordinary voters looking for information. It was one of the best debates I’ve attended. Last night, Bob Barr and Barry Loudermilk spoke at a candidate forum hosted by the Acworth Business Association and Barr questioned Loudermilk over an issue originally raised by WSB-TV. Critics are questioning a local politician who now says he owns the copyright to a video that was produced with $10,000 of taxpayer money. The video, called “It’s My Constitution,” features former state senator and current congressional candidate Barry Loudermilk and his three children talking about the importance of the U.S. Constitution. 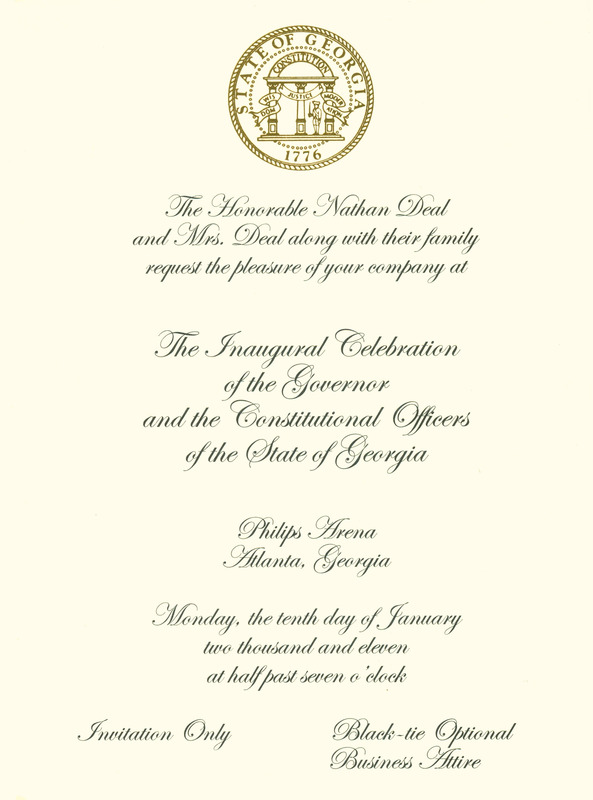 It also features an introduction from State Education Superintendent John Barge, and was sent to Georgia classrooms for use in studying Constitution Day. “It’s paid for with taxpayer dollars; arguably the public owns that,” said Georgia Department of Education spokesman Matt Cardoza. During the credits of the 15-minute video, a copyright in the name of “Firm Reliance” appears on the screen. Firm Reliance is a non-profit organization registered to Loudermilk. The video is prominently featured on the non-profit’s website. “If it’s in the public domain and the public paid for it and it’s for the public, why have any copyright on it?” Fleischer asked Cardoza. Loudermilk said because he and his children were not paid for their time writing and casting the video, they legally hold the copyright, not the Department of Education. He said they are going to use the copyright to protect the video. Loudermilk added that his family and non-profit have never charged anyone to use the video and will continue to allow access to the video for educational purposes. Are you willing now to come forward tonight — with a degree of transparency that you seem to hold very high when you talk about these issues — and tell the voters what you are hiding with regard to your lack of transparency on these and other issues involving abuse of taxpayer money,” Barr said on the stage at NorthStar Church in Kennesaw. Loudermilk said he has never made any money on the film and that it was copyrighted to protect its content. The “other issues involving abuse of taxpayer money” that the AJC saw fit to omit included a payment of $80,000 by the state (that means your taxpayer dollars) to settle an employment discrimination lawsuit by a woman who worked in the office that Barry Loudermilk shared with another state Senator. In a statement, [then-Senate President Pro Tem Tommie] Williams’ office told Geary the state Senate is not subject to the open records act and the matter related is a personnel matter. At the time, Loudermilk claimed no knowledge of the lawsuit. In a statement released Wednesday, Loudermilk named the employee as Ethel Blackmon. “Though Ms. Blackmon did work in my senate office for a short time, I have never discriminated against her or anyone else, and this issue has never been raised to me. The media has also reported an alleged monetary settlement made to her, which they claim had something to do with me. I have never been consulted about a settlement, nor did I know anything about one before hearing of media reports [Tuesday],” Loudermilk said. Georgia has been represented on Capitol Hill in recent years by a pair of the steadiest and most-respected members of the U.S. Senate: Saxby Chambliss (R-Moultrie) and Johnny Isakson (R-east Cobb). Now, Chambliss is calling it a career and retiring at year’s end. Vying to take his place are two Republicans who will meet in a July 22 primary runoff election: Jack Kingston and David Perdue. Perdue is one of the big surprises of this campaign season. The multi-millionaire former CEO of a string of well-known companies largely self-funded his campaign and came out of nowhere to be the leading vote-getter in the May 20 GOP primary. In the process he gathered more votes than a number of better-known candidates, including three incumbent congressmen — one of them Kingston. Perdue trades on his “outsider” status as a non-politician and plays to those fed up by the constant bickering and gridlock on Capitol Hill. It’s a feeling with which we sympathize. Yet Perdue has never crafted a bill, advocated for it and shepherded it to passage. He’s never had to rally his party’s faithful, line up votes or — as successful legislators must do — learn how to compromise on the occasional detail without selling out on his underlying principles. In other words, Perdue has the luxury of having no record to run on. He is a blank slate on which voters can pin their hopes. He talks a good game about transforming Washington, but, as every president learns, even the most powerful man in the world can only change the culture there by so much. And as just one senator of 100, whoever is elected will find there is no magic wand awaiting him. Jack Kingston, on the other hand, has written and passed many a bill and cast thousands of thousands of votes during his time in Congress. He stands by what he’s done for his district, this state and this country. He’s a known quantity — and he’s not the kind of lawmaker who’s been corrupted by the Capitol Hill experience. Perdue is eager and affable, but given how he’s spent recent decades rubbing elbows with upper-crust business types, we’re not sure he truly understands the economic challenges of the merchants on Marietta Square, or of those shopping at the Avenues in east and west Cobb, much less the grind of living from paycheck-to-paycheck like far too many do, even in a prosperous community such as ours. Keep in mind a Nunn win would mean another vote for a continuation of an Obama-type/Reid/Pelosi agenda. That makes it incumbent on Republican voters to choose the candidate who will offer Nunn the strongest challenge. And Jack Kingston is that Republican. Yesterday, Secretary of State Brian Kemp released information on the number of votes cast so far in early voting. Those numbers differ from those we wrote about yesterday because Kemp’s numbers were based on a later version of the Voter Absentee File that was not yet publicly available when we were writing yesterday. Illegal immigrants shipped to Georgia? The AJC was skeptical of claims that illegal immigrants were being brought to Georgia when Bob Barr raised the issue on Monday. The AJC’s Jeremy Redmon queried the Barr campaign – specifically, campaign manager and son Derek Barr – for actual evidence of dangerous women and children from the outer reaches of Guatemala, dispatched to subvert the wisdom and justice, constitutionally dispensed in moderation, of our fair state. Yesterday, the AJC’s partner in the Cox Media Group, WSB-TV reported that indeed, “unaccompanied minors” are being transported to Georgia. “They’ve been flooding into Atlanta for the past probably month and a-half,” attorney Rebecca Salmon told Channel 2’s Kerry Kavanaugh. Salmon runs the Access to Law Foundation. The nonprofit represents children who arrived in America alone. The federal government calls them unaccompanied minors. The Gwinnett County-based foundation represents kids who have reunified with family in Georgia, Alabama, parts of Tennessee and South Carolina. “Our current caseload is well over a thousand kids,” Salmon said. Salmon said she helps the children determine the best option for them, which she said is often voluntarily leaving the U.S. The majority, she said, will ultimately be deported. A small percentage could stay under special circumstances, like if they meet criteria for political asylum. Georgia’s colonial charter, signed by King George II was witnessed on June 9, 1732. Cream was formed on June 9, 1966 by Eric Clapton, Ginger Baker, and Jack Bruce. On June 9, 1973, Secretariat won the Belmont Stakes and the Triple Crown, the first to win all three of the Triple Crown races since 1948. Secretariat was bred by Christopher Chenery, a graduate of Washington & Lee University in Lexington, Virginia, whose jockeys wore blue-and-white silks in honor of Chenery’s alma mater. On June 9, 1976, Jimmy Carter’s opponents in the Democratic Primary for President, George Wallace, Henry Jackson, and Chicago mayor Richard Daley, released their delegates and endorsed Carter, assuring the Georgian of the nomination. Last week, Bill Nigut at Georgia Public Broadcasting wrote about the 70th Anniversary of D-Day and he began with the headlines from the Atlanta Journal and Constitution. Reading the reports of the invasion as journalism rather than history makes even clearer the extraordinary courage and dedication of the soldiers who stormed the beaches, fighting for freedom and the preservation of Western democracies. Nothing can ever diminish the sacrifices made by young men – many of them no doubt Georgians – far from home on the beaches of Normandy on that historic day. How ironic then, that the front page of the June 7, 1944, Atlanta Journal also carries another important story just under news of the invasion: “State Group Bans Negros in Primary. Subcommittee Holds Only White Electors Eligible to Vote.” The story reports that a subcommittee of the Georgia Democratic Party had adopted a resolution reaffirming the rule of the party that only whites could participate in the July 4 primary election. (Yes, another irony – the election would be held on Independence Day.) Georgia Democratic officials had found it necessary to reaffirm the rule in response to a U.S. Supreme Court decision handed down in April, 1944, which declared that Texas could not block black voters from casting ballots in primary elections. Georgia Democrats insisted the ruling had no impact here. The history that we share as Georgians is so complex, so difficult to try to reconcile. It’s soul-piercing and almost unfathomable in today’s world to acknowledge that the heroism of Georgia soldiers liberating Europe stood in such stark contrast to the disenfranchisement of blacks at home. Freedom for the French began on that June day in 1944. It would be two decades later before blacks here won the right to the vote with the passage of the Civil Rights Act of 1964. From reader feedback, I know that the short history segments are very popular and entertaining. I hope they’re educational, because many of the historic struggles of Georgia from the colonial period, when Georgia was reticent about joining the Independence movement and considered particularly unfriendly to taxes, through the civil rights movement, still resonate today. The structure of our elections, which include runoffs, originate in the days in which African-Americans were being forcibly excluded from civic life under the one-party rule of white Democrats. Recently, the issue of reparations for African-Americans has been resurrected as a topic of national conversation. The better we understand our history, the better-prepared we are for the future. Jack Kingston, in his bid for United States Senate, received the endorsement of Congressman Rob Woodall (R-7) last week. U.S. Rep. Rob Woodall on Friday morning announced that he would pledge support for Kingston, the Savannah congressman running against businessman David Perdue for the U.S. Senate seat to replace the retiring Saxby Chambliss. The Senate GOP primary runoff will be July 22. In-person early voting begins on June 30. Tom Crawford writes that endorsements from primary opponents might not be that helpful. If you look at voter turnout figures in recent election cycles, it’s clear a large percentage of primary voters don’t bother to return for the runoff. The number of ballots cast in a primary election usually declines by 40 percent or more in the runoff – sometimes by more than 60 percent. It’s a matter of human nature. Voters whose candidate was eliminated in the primary have much less incentive to turn out for a runoff election than those who voted for a successful candidate. They simply stay home on the day of the runoff. Setting aside the question of how many supporters will bother to vote in the runoff, there is the issue of how credible an endorsement can be when the candidate was so harshly critical of the person she is endorsing. Most of the ink used in analyzing the results of the May 20 Republican Primary has been devoted to the question of Tea Party influence versus the Establishment, but it’s worth noting that some 66% of Georgia Republican Primary voters cast their ballots for an incumbent Congressman to take Saxby Chambliss’ seat in the Senate. Cheryl Hill, widow of the late State Rep. Calvin Hill, has endorsed Wes Cantrell in the runoff election for the seat formerly occupied by her husband. The endorsement from the Hill family comes on the heels of Cantrell garnering the most votes in the primary on May 20, despite campaigning for a quarter of the time his two opponents did. Hill’s support follows the endorsements of Representatives Michael Caldwell and Scot Turner, and State Senator Bruce Thompson – all representatives of Cherokee County in the state legislature. Some of the best endorsements are when your campaign finance staff stamp “For Deposit Only” on the backs of checks, but what level of scrutiny should candidates give their donors before depositing their money? Luckily, we have enterprising reporters who are ready to check out the history of political donors. Chris Joyner of the AJC writes about a small number of Kingston donors. In late 2013, Kingston, an 11-term Republican congressman from Savannah, took in $80,052 in contributions from employees, their family members, consultants and contractors of two virtually unknown Gwinnett County companies: Confirmatrix Laboratories, a 2-year-old firm that performs urine and drug testing, and Nue Medical Consulting, a medical billing company founded last September. Both companies are linked to Khalid A. Satary, a Palestinian also known as DJ Rock, who served more than three years in federal prison for running a large-scale counterfeit CD operation in the metro Atlanta area. Satary was released from prison in 2008 and federal officials have been trying to send him to out of the country ever since. The AJC asked Kingston about the donations, a related fundraising event, and Satary’s criminal past on Wednesday. On Friday, the campaign announced Kingston would return the contributions. My thoughts? I think that crooks and criminals are likely to be sneaky when they make contributions to politicians, and it’s hard to expect politicians to run a full criminal background search on donor. But a quick Google search on major donors or bundlers is not too much to expect today. And, as in the case of the NBA forcing Donald Sterling to sell the LA Clippers for $2 billion dollars, are we better served when people whose actions we disapprove of have more money? Returning the questionable donations is a good move, and about all you can expect. Governor Deal appointed former State Senator Greg Goggans to the Georgia Board of Dentistry, a good choice in my humble opinion. As both a practicing hand-in-mouth professional, and a former state legislator, there are few better qualified to help the state agency move forward. Of 34 Republican state senators in 2009, about 60 percent — 20 — have left the chamber (and at least three more are leaving at the end of this year). About two-thirds of those are back involved in state government, according to an Atlanta Journal-Constitution analysis. Recently, the University System hired state Sen. Cecil Staton, R-Macon, to a newly created $165,000 a year administrative job. Also recently, former Senate Majority Leader Chip Rogers was fired from his $150,000 a year job with Georgia Public Broadcasting, a hiring that brought Deal political grief when it was announced in late 2012. The Senate Republican class of 2009-10 now gone from the chamber includes several other highly paid Deal appointees, a judge appointed by the governor, the state’s insurance commissioner, a couple of state House members, a Department of Transportation board member and some lobbyists. [T]he contest between the 38-year-old Mr. Carter and Mr. Deal, 71, could be surprisingly competitive. A poll released May 26 by Rasmussen Reports showed Mr. Carter with a 48% to 41% lead. But other polls have found Mr. Deal ahead by several percentage points. RealClearPolitics, a news and polling aggregator, calls the race a tossup. Recently Mr. Deal spoke at a state film industry meeting held at Manuel’s Tavern, a bar on Atlanta’s east side that was owned for years by a Democratic politician and where Jimmy Carter announced his plans to run for governor in 1970. Mr. Deal plans to lead a business mission this month to Israel, a not-so-subtle effort to highlight Jimmy Carter’s criticism of Israeli government policies toward Palestinians. That criticism angered many Jewish Americans. The Deal campaign has raised more than $8 million so far, while the Carter campaign has raised $1.9 million, according to recent campaign filings. Chip Lake, a Republican strategist, is heading the Georgia Victory Fund, a super PAC with a goal of raising $1.5 million to $2 million from national donors to criticize Mr. Carter in commercials. “He’s now walking on the stage that he has never been on before, and it’s our job to turn the lights on and make them very bright,” Mr. Lake said. To win, Mr. Carter, a state senator who has never run for statewide office, would need blacks and Hispanic voters, whose numbers have been growing rapidly in the state, as well as liberals and independents. He also has to win more rural white voters—who for years have voted mainly for Republicans. Scott Buchanan, a Southern politics expert at the Citadel in Charleston, S.C., said shifting demographics will make Georgia a political battleground “in the next election cycle or two,” but it is unclear if changes will lead to Democratic wins this fall. While it hasn’t yet received much attention from the press, Senate Resolution 415 by Senate President Pro Tem David Shafer is receiving positive attention by grassroots Republican activists. SR 415 places on the November ballot a Constitutional Amendment for the voters. Upon the passage of SR 415, Shafer discussed the rationale for the Amendment. This weekend, the Jackson County Republican Party and the Teen Republicans State Convention both endorsed the Shafer Tax Cap Amendment. Georgians are generally bullish about the direction of their state but want lawmakers to remain focused on boosting an economy and job market that voters say remains weak, according to a new poll conducted for The Atlanta Journal-Constitution. A majority of registered voters say the state is headed in the right direction, with 51 percent saying they are satisfied with Georgia’s course and 7 percent who say they are very satisfied. But, asked whether their personal financial situation is better or worse than five years ago, or if jobs are readily available in their communities, voters are much less optimistic. 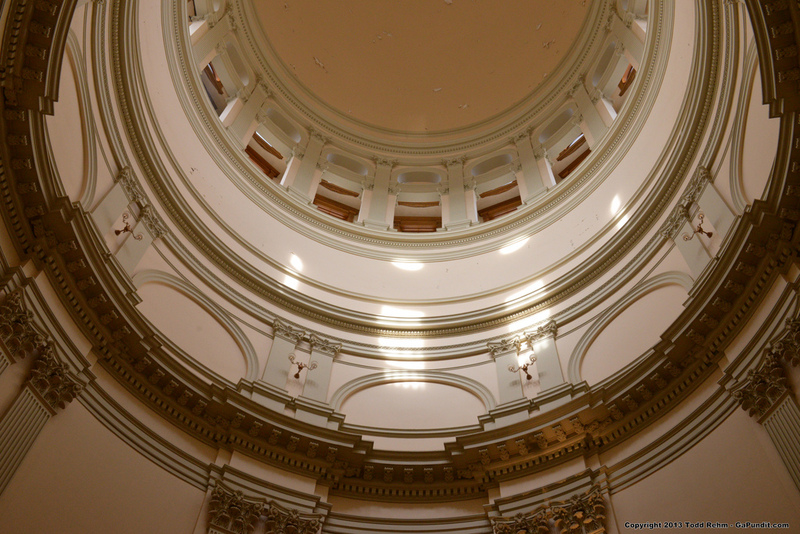 Voters indicated that they generally support the job state lawmakers are doing. The poll showed 45 percent of respondents approve of the General Assembly’s job performance, compared with 39 percent who disapprove. But when it comes to one of the top priorities for 2014 for the Republican majorities in the House and Senate, voters gave a resounding thumbs down. The GOP leadership in both chambers wants to greatly expand where gun owners can carry firearms. But voters in the poll by majorities exceeding 70 percent said it was a bad idea to allow owners to carry guns on college campuses, into churches and other locations. The poll, conducted by Abt SRBI of New York, surveyed 802 adults statewide between Jan. 6 and Jan. 9 on what issues Georgians want their Legislature to tackle in 2014. The margin of error for each response is plus or minus 4 percentage points. The poll was conducted by live operators and included respondents via cellphone and landline. via Georgia voters positive about the state, but not guns | www.ajc.com.